I have been following the only other FA blogger for months now. I wrote to you about him back in January. He is from the Philippines, which is where Zhenny is from. 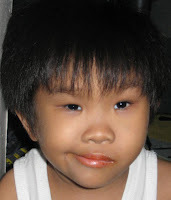 The blog is called "Save Jack Simbulan from Fanconi Anemia." Jack's dad was keeping everyone updated on his progress. This is what he wrote yesterday. It is very very hard to say goodbye. But it is selfish to keep you with us when you do not seem to get any better. We have given you the best that we could possibly give. We have begged God for mercy countless times. We’re really sorry that our best could not save you. You know we really really tried. And we know you did too. You were such a brave kid, with such tenacity and will to live. We’re very very proud to be your parents. We feel blessed to have been part of your life. 6 years is better than 0 years. We regret that we were not able to spend a lot of time with you because we were both working. But we are thankful for the nice vacations together: Baguio, Palawan, Tagaytay, Subic, ChiangMai, Singapore, LA. It was money well spent with you. We were really hoping and praying that we could beat FA. We were ready to beg from people and have in fact started doing that. But this disease is plain cruel. It has robbed you of energy, playfulness and laughter. We have said to you all the things that you needed to know, especially in our last month in the hospital. You only need to remember that we love you. And even if you go away, that love will not change. Ever. You will always be our baby – the one who went through such odds, the one who has given our family so much joy and laughter in the last six years. We’d like to say sorry for whatever shortcomings, for sins we may have committed knowingly or unknowingly. Sometimes, we take our role as parents too seriously. Anyhow, rest our child. Go to God, Jesus and the saints. To heaven where there is no more suffering. We will always love you. Until we see each other again. Happy 12th Birthday Beautiful Boy. I haven't forgotten you. I have been writing and taking notes and taking pictures. I just haven't put them up here yet. I thought I would spend today doing that as a way to celebrate your birthday, but we were out and about most of the day. As a rainbow rose up and disappeared into the low clouds over nearby Blue Mountain and a teddy bear snuggled next to the young boy's body in an open casket, Barry Simon's family and friends gathered Wednesday morning to celebrate his short life on this earth. Through their tears, his old classmates described a friend who could be counted on to pick them up when they were down, neighbors called him the sweetest boy they'd ever met and one of his older sisters, Brittany, called him her hero. Laughed? Less than 24 hours before he died, Barry Simon was not only laughing. He apparently was still chasing girls. As she mimicked his tone, it was clear Barry was ready to apply for the job if it was open. The next afternoon, Simon, 13, died in his mother's arms after a five-year battle with a rare genetic disease - for which there is no cure - called Fanconi anemia. Most of the last two years were spent in Seattle in a grueling attempt to prolong Simon's life into his 20s or 30s via a bone marrow transplant. For some of the 100 or so people who gathered for the service at Christian and Missionary Alliance Church in Missoula, a slide show highlighting Simon's 13 years - including pictures from Seattle - may have been their first glimpse as to what the boy had been through, and how hard he had fought, the last two years. 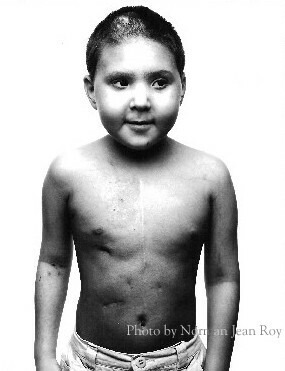 Simon left Missoula in August 2005 as a wiry 11-year-old but as infection after infection pounded him after the transplant, the medications he was on doubled his weight and inflated his head and torso to twice their normal size. Indeed, said his mother, Cindy Wamsley, his happiest days were his most recent, once the decision had been made to halt the daily blood transfusions and all but a handful of the medications that were keeping him alive. That meant he could finally come home, to Missoula, where hundreds of people had sent him thousands of cards and letters during his stay in Seattle. Simon stayed active up to the end, when a Hummer stretch limo arrived at the family's Missoula apartment on the morning of his death to take the boy and his family to Saturday's Montana-Weber State football game. He'd gone to Little Grizzly football games two days before he died and spent several hours shopping at the mall the day before, but wasn't up to attending the Grizzly game, a trip arranged by Montana Highway Patrol Officer Richard Hader and the Montana Hope Project. The same stretch limo returned to the apartment Wednesday to deliver Simon's family, including his mother and stepfather, Richard Wamsley, and sisters, Jamie Mullikin and Brittany, to the funeral. Even after coming home to die, Simon had made new friends - from Mayor John Engen, who spoke at the service and admitted to filling Barry with “far too much caffeine and sugar” during an otherwise unsuccessful shopping trip to buy a Simon a ferret, to April Christofferson of Lolo, who told of meeting Cindy and Barry in a supermarket after they moved home last month. The boy considered it for a moment, then walked behind the meat counter, grabbed something, came back out and slapped a 𔄚-for-1” label on the salmon package. “Now you can get more,” he told her with a mischievous smile. Before they parted ways, Christofferson had learned of the boy's desire to get a pet ferret, and vowed to find him one - which she did, in Coeur d'Alene, Idaho. She delivered it two weeks ago. “I was truly amazed,” he said. And as the mourners filed past the open casket after the service for one last look at the boy, you knew Barry Simon had to be smiling someplace. When her turn came, Madelyn Roy leaned in and kissed him. Reporter Vince Devlin can be reached at (406) 319-2117 or at vdevlin@missoulian.com. Looks like Adam Nash just had a birthday. I was trying to do something nice for Molly and it fell through. I feel terrible about disappointing her. It is Joe's birthday on Saturday. He will be 6. A lot of festivities are planned. Later on I will show you what we got him for his birthday. I'll give you a hint: it has something to do with baseball. Joe is proud that he is the best underarm farter in school - according to him. He says that Samantha Knapp is pretty good too. Oct. 1--The first child in the world born after PGD confirmed he would be a bone marrow match for his older sister is today 7 years old and in first grade. Lisa and Jack Nash of Englewood, Colo., said they tested their son Adam's embryo to ensure he didn't have the bone marrow disorder Fanconi anemia his sister Molly had and to ensure he would be a tissue match for her. The Nashes speak publicly to people all over the world about what they did to cure their daughter. "By us being public, other people learn about it," Lisa Nash said. Fanconi anemia is similar to Diamond Blackfan anemia, the bone marrow disorder Katie Trebing has, in that the patient needs regular blood transfusions to stay alive. However, it is more dangerous. Molly was a few months from death when she had her bone marrow transplant in 2000 using blood from Adam's umbilical cord, Lisa Nash said. Saving Molly's life was not the sole reason the Nashes had Adam, Lisa Nash said in a telephone interview. "We had Adam first and foremost because we wanted a bigger family," she said. The Nashes said they would have had Adam through PGD to ensure he didn't have Fanconia anemia, even if it wasn't an option to also check for sibling matching. "The fact that he was able to help her really was icing on the cake," she added. Molly had a bone marrow transplant using Adam's umbilical cord blood the month after he was born. Her bone marrow is now free of Fanconi anemia. However, there are still concerns about her health. "These kids are still very prone to certain types of cancer. We watch her very closely for head and neck cancers," said Lisa Nash, 41. Molly has other physical ailments related to her disease. She is deaf in one ear, was born without thumbs, and is fed with a feeding tube, her mother said. Her thyroid failed -- a late-term effect of the chemotherapy that preceded the cord blood transplant -- and she recently had surgery to correct cataracts. Molly is now 13 years old and is in seventh grade. "The spirit in her and the fire in her -- she is just an amazing, amazing kiddo," her mother said. The Nashes have since had another child using PGD to avoid Fanconi anemia. Delaine Nash is 4. The Nashes said they don't talk to the children about the role Adam played in Molly's survival. "If you ask Adam what happened, he'd say, 'I gave Molly my blood so she would feel better.' Someday when they're old enough, we'll explain it to them," Lisa Nash said. "We want our kids to have normal lives and be just like everybody else." She scoffs at critics who fret donor children such as Adam might one day feel they weren't really wanted. "Adam, being the sole male in the family, he is the be all and end all," she said. He is "idolized" and "adored," she said. To anyone who worries taking a cell from an embryo -- as is done in PGD testing -- might prove harmful later, Lisa Nash said of her son, "He walks and he talks and he reads. The only thing we see is he can't play basketball, but neither can his father. If you want to attribute something to pulling off the single cell, he can't play basketball." As for how much they would use Adam in the future to help Molly, Lisa Nash said she and her husband decided before Adam was born they would only use his cord blood and not his bone marrow to cure Molly. "Adam was brought here because we loved Adam and not for spare parts," she said. The cord blood, she said, was "his garbage. He didn't need it any more. When it came to taking bone marrow from Adam, that wasn't okay in our eyes. That's where we drew the line." So far, they haven't had to test their resolve. Lisa Nash said she is a proponent of government oversight of the use of PGD technology. "The government should look at it and put some kind of boundaries and barriers," she said. Perhaps, she said, insurance companies might also pay for the procedures if they were regulated. She said they spent $250,000 to have Adam, because they had to go through in vitro fertilization five times before it worked. They took out a loan to pay for it. Here is a story about Christina Curkowskyj of Australia. She has FA, and like Amitai and Molly, she was saved by her brother who gave her new, good blood. I am glad it is working more now. We were pretty close sweetie. I don't know if I ever told you about another little boy named Henry who has Fanconi anemia. He lives in New York. His mommy just wrote and let us know that their new baby, Luke, is a perfect 6 out of 6 match for Henry. Unlike us and Amitai's and Molly's parents, Henry's parents had Luke "the old fashioned way" which means without doctors helping try to make sure the baby was one who could save Henry and not have the disease. Henry's family has been through a lot and really deserve this good news. Henry's dad was a firefighter who was at the World Trade Center buildings when they fell. Christina, who has the rare and deadly genetic disease Fanconi's anaemia, was given three months to live almost five years ago after her bone marrow began failing. Now she's a lively chatterbox in grade 3 who loves riding her new blue bicycle and is anxiously awaiting the arrival of a baby sister. "I'm excited because I'm going to do a lot of work, to play with her -- and pick up after her toys," Christina said. "But I can't keep her in my room." Christina said she loves her brothers, Mykola, 7, and Thomas, 5, because they "encourage me". In January 2003, Christina became the first Australian child with Fanconi's anaemia to survive a life-saving stem cell transplant from a perfectly matched sibling -- baby brother Thomas. The ground-breaking transplant came more than a year after Christina's parents, Melbourne designer-baby pioneers Roman Curkowskyj and Tania Kutny, began their fight to create a genetically screened baby using IVF. Thomas was conceived naturally while his parents were waiting for a decision that would allow doctors to screen IVF embryos to save their daughter. He was a miraculous perfect tissue match with his sister. The couple continued their battle and in the process helped change the rules for other Victorian families with terminally-ill children. Mr Curkowskyj's IT job has taken the family from Melbourne to scenic Markham, on the outskirts of Toronto, Canada, where they expect to spend the next two years. Christina has no serious illnesses, recently overcoming a tumour in her liver and facial paralysis from a brain infection last year. She no longer has bone marrow failure, but still has Fanconi's anaemia, which leaves her susceptible to developing a range of cancers. Christina has had more than 40 operations, including the transplant in which stem cells were taken from Thomas's cord blood and injected into Christina in the same way a blood transfusion is done. She has also had skeletal and heart surgery. Christina is being treated by a team of 13 specialists and goes weekly to rehabilitation clinics. She has a teacher's aide and a nurse at school to help with her hourly tube-feeds, and at night she is fed by a machine. Despite the daily medical hurdles, Christina and her family are determined to make each day count. "It's a good time," said Ms Kutny, 42. "She's just overcome having the tumour in her liver. "We got over that hurdle using Chinese medicine, because Western medicine didn't have any hope for us. "We're out of hospital and life is good, and now we have another one on the way. "As long as we are out of hospital we're happy. "It's a time that you cherish. "We go a lot to hospital for clinics and she is always afraid about: 'Am I going to stay?' "
After years of medical wards, Christina knows well the difference between being in hospital and at home. "She lives it up," Ms Kutny said. "She wakes up and she's like, 'It's a great day, I'm not there (in hospital), and I'm here and I'm here with my family and I've got my baby coming, (and) I've got my brothers'. "She appreciates what she has, so she's learnt a lot too in her little life. "From the time she was born, we appreciated that it was fragile -- life -- and we made a commitment that we would make the most of it." Mr Curkowskyj, 44, said Christina was "the biggest gift we could ever have". "She's taught us to live for today and to be grateful for today," he said. Getting this email this morning put a smile on my face. To track the latest status of your shipment, click on the tracking number above, or visit us at fedex.com. We sent a brand-spankin'-new video iPod, called an iTouch, iThink, to a kid, Jacob or Coby Bennett, who was one year ahead of you at JPDS. He was in Jake's second grade class. He is now at Children's Hospital because he is sick. 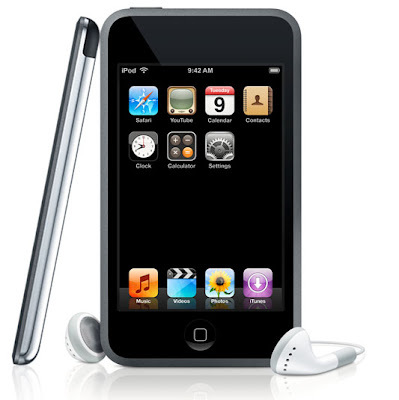 I hope watching movies and listening to music on the iPod helps him as he goes through his chemotherapy. I was thinking about riding my bike and dropping it off myself, but I am a little maxed out on sad, partly because of Barry dying, and I didn't really know how walking into a hospital would feel. 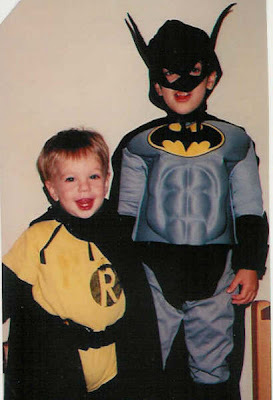 This picture of Coby and his brother reminds you of who? A lot of our friends, like Linda and Sid, know Coby and his family well. I know he'll be okay, but I am sure this is hard. When Sonny Clark retired, he thought he and his wife Linda would enjoy their golden years at a slow enjoyable pace. "No alarm clocks and traveling," he said. Instead, neither have had more than a few hours of sleep since their great grandson Trey was born. The two Chesapeake seniors have full custody of the two year old who has multiple health problems. Trey was born with reflux necropathey, which means his kidneys do not function, he needs dialysis daily and can not eat. He gets his nutrition via a feeding tube which sends fluids straight to his intestines. "He can't eat anything with out throwing it all up," Sonny explained. Trey needs a kidney transplant which doctors were preparing him for when they made another medical discovery, Trey also suffers from a rare genetic condition called fanconi anemia, the only way to treat it is with a bone marrow transfusion. The family flew to Minnesota to see a specialist when it got even more bad news, a neighbor called last week to tell them their house had been burglarized. "They stole a tv, some medicines and some knick nacks," Sonny said. Sonny says,right now, his insurance company has not said if it would pay for Trey's bone marrow transplant which could cost one million dollars. Friends are stepping up to help out, organizing fund raisers which could start as early as next week. No matter what happens, Sonny says his family will fight to keep Trey alive. Thirteen-year-old Barry Simon died Saturday. The Missoula boy had caught the attention and admiration of hundreds across the state during his fight with a rare genetic disease called Fanconi anemia. During his past two years of medical treatment in Seattle, hundreds, most of who had never met Barry, wrote letters and sent email—one couple even doled out a weekly $5 allowance. Early last month, Barry happily quit the transfusions that had been keeping him alive, stopped taking all but a few of his 30-plus medications and returned home, where he could be surrounded by friends and family, to die. Occasionally there are stories that make you stop. Stop worrying about your own problems. Stop wasting time. Stop and appreciate your health. Barry’s story is a stopper. If you haven’t read Vince Devlin’s stories about Barry (Last goodbye: After two years in Seattle, Barry Simon comes home to die; and Barry Simon dies in mother's arms), read them. I can’t tell you what you’ll gain from Barry’s story; I imagine it’s a different lesson for each person. But, I can tell you you’ll gain something. I can’t imagine how you couldn’t learn from a 13-year-old who’s able to face something most of us are terribly afraid of with such candor. Barry’s story also serves as an important reminder to journalists: Sometimes the best stories don’t come from the borders of war-torn countries, political scandal, or crime. Sometimes they come in the form of a sick 13-year-old boy who’s wiling to share his story. Barry and his mom did it right. I am so glad that he had a good week. It sounds a lot like you. Remember how we took you to Toys R Us right before you died. It wasn't such a hot trip. Also, you and I had tickets for the University of Minnesota football game, but you got a fever and we didn't go. I feel so bad for Barry's mom, but I am glad he isn't suffering any more. MISSOULA — Cindy Wamsley curled up next to her son in his bedroom Saturday afternoon, and whispered in his ear. “It’s OK to go to heaven,” she told him. “Mommy, I’d get there faster if I knew how,” Barry Simon answered. They fell asleep together. Wamsley opened her eyes a half hour later. The 13-year-old Missoula boy, who captured the hearts of hundreds of people during his two-year battle with a rare genetic disease called Fanconi anemia, died in his mother’s arms at about 3 p.m.
Simon died after one of the best weeks of his life since he left Missoula in August 2005 to undergo a bone marrow transplant. He got to see his oldest sister and grandfather, who traveled from California. Several old classmates and many people who had written him cards and letters stopped by to say hi. Russ and Shirley Van Tine, who have faithfully mailed him a $5 weekly allowance since the transplant, came by to tell Barry they were raising his allowance to $10. At the invitation of coaches, Simon attended Little Grizzly football games Thursday. On Friday the family was off to the mall, where they spent six hours shopping. “The last two days, you could hardly tell he was sick,” Wamsley said. A Hummer stretch limo pulled up to the family’s small Missoula apartment. Simon and his family were to go to the University of Montana’s homecoming game against Weber State, on a trip arranged by Montana Highway Officer Richard Hader and the Montana Hope Project. Hader had gotten sideline passes for all of them. But Simon, who stopped the daily blood transfusions that were keeping him alive three weeks ago, and went off all but five of his 30-plus medications two weeks ago, wasn’t up to it. The limo left, and later Simon asked to take a nap. Simon had wanted his bedroom painted black, and Wamsley and daughter Jamie had about a third of it finished Friday when Jim Bauer, another of the boy’s regular letter-writers, called Wamsley to see if there was anything he could do. Bauer came over that evening and completed the job, then arrived Saturday morning to help put up black curtains. When Simon asked his mom to take a nap with him Saturday afternoon, Bauer carried the boy from the living room couch into his bed. The little apartment was filled with family and friends including April Christofferson, who recently bought Barry a pet ferret but Wamsley shooed them out as she and her son curled up in the bed and she whispered the last words Barry would hear. 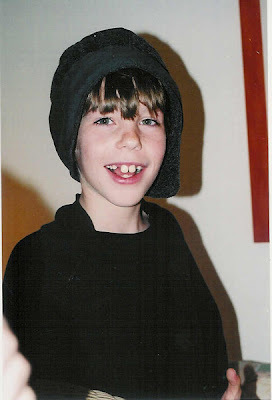 Simon was born March 30, 1994, in Walnut Creek, Calif., underwent surgery immediately and spent the first 19 days of his life in the intensive care unit. Simon is survived by his mother, two sisters Jamie Mullikin of Sacramento, Calif., and Brittany of the family home; his stepfather, Richard Wamsley; and Wamsley’s children Robert, Michael, Kelly and Greg; his grandfather and his wife, Lemual and Rozzane Southorn of Redwood City, Calif.; and his grandmother, Anita Smith of Modesto, Calif.
“He’s home now,” Wamsley said. “He waited until his family was here, he waited until his room was painted black. I just had to close my door so no one would hear me weeping.